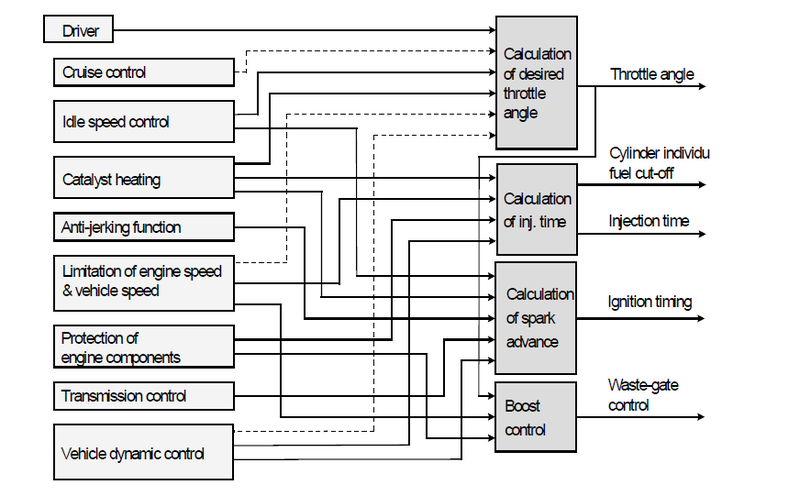 In older generation engine management systems, different internal control subsystems had conflicting demands on the overall control system, with no real co-ordination. This meant that there was an interdependence between these systems, which was difficult to handle during calibration and did not provide the optimum with respect to an overall engine control concept. The answer was a 'torque' based architecture in the ECU - that is, to focus on the driver demand for torque, rather than respond to the throttle pedal postion. The block diagram above shows the conflicting requirements - the answer was a torque based control architecture – an overall torque demand manager (TDM) co-ordinates all the overall torque and efficiency input values. 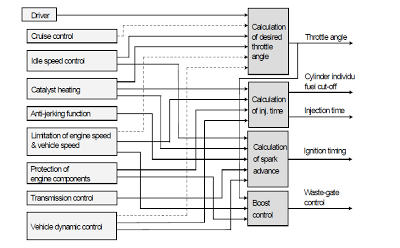 Internal inputs are typically defined by the engine operating mode and protection limits, external inputs are driver demand, cruise control and vehicle dynamic control values (ABS, Stability control etc.). The TDM process the inputs, taking into account drivability optimisation factors (thus allowing ‘tuning’ of the vehicle behaviour with respect to vehicle type and driver expectation). 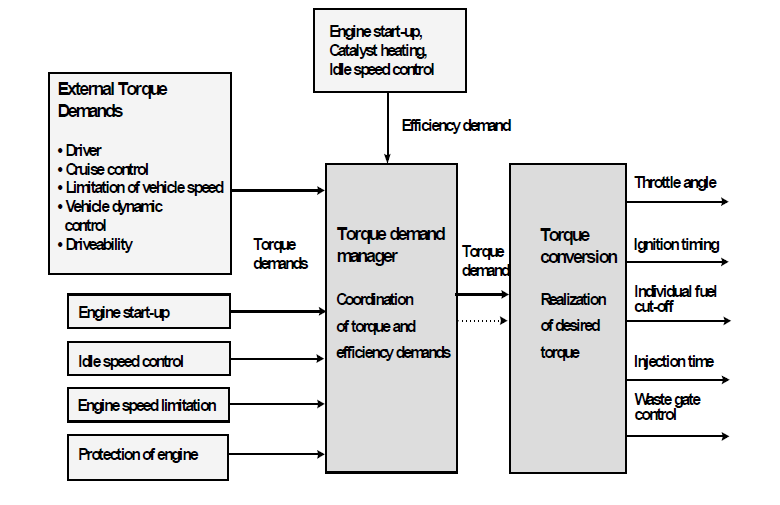 The final output from the TDM is a required torque value, this is realised by the controller output stages and connected actuators which are available to influence the engine torque output – typically throttle angle, ignition timing (SI engine), injection parameters (SI and CI engine) and turbocharger control. But how is engine torque measured? well it isn’t! it is derived from an internal model that takes into account cylinder air charge, lambda and ignition timing (SI engine). Combustion generates a cylinder based ‘internal’ torque, from this gas exchange and friction losses are estimated and subtracted, and this gives a final engine output torque. Clutch torque can then be derived by subtracting engine ancillary torque absorbers, for example, Electrical and HVAC loads. Thanks for sharing such a nice information on Torque based architecture. It will help me when I next time perform ecu remap on any car.